LEIRIA, Portugal (CNS) — Pope Francis said his two-day pilgrimage to Fatima would be a time of prayer and encounter with Jesus and Mary. 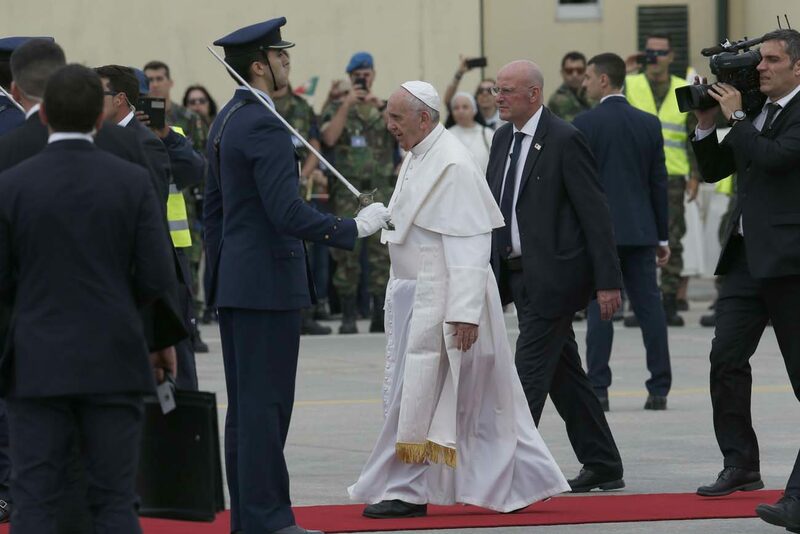 After a three-hour flight, during which Pope Francis greeted each of the 69 journalists traveling with him, the papal plane landed at Monte Real air base, about 25 miles from Fatima. The pope’s trip was planned for the celebration of the 100th anniversary of Mary’s apparitions to three shepherd children in Fatima. On the actual anniversary, May 13, Pope Francis was to canonize two of the three young seers, Blessed Jacinta Marto and her brother Blessed Francisco Marto, making them the youngest non-martyred saints in the Catholic Church. Arriving at the military base, the pope was welcomed by Portuguese President Marcelo Rebelo de Sousa and held a brief private meeting with him at the base. He also visited the base chapel and blessed sick members of military families. Before leaving his residence at the Vatican that morning, the pope met with six women, who “had been through tough times,” said Greg Burke, Vatican spokesman. Two were pregnant and several were migrants. They all brought their children with them to meet the pope. Cardinal Pietro Parolin, Vatican secretary of state and the pope’s closest collaborator, said Pope Francis’ visit would “express his own love and devotion to Mary” and his great respect for the Marian devotion of Catholics around the world. In the apparitions of Our Lady of Fatima to the three shepherd children, Pope Francis sees an example of the Mary described by the Magnificat, the biblical hymn of praise for the great things God has done through her, Cardinal Parolin told L’Osservatore Romano, the Vatican newspaper. Bishop Antonio dos Santos Marto of Leiria-Fatima, also writing in the Vatican newspaper, said the Fatima message has touched so many people around the world for generations because it spoke and continues to speak about strengthening faith when the world around one is in turmoil.